No matter what type of business you are in, implementing an ERP solution is a critical project that must be taken seriously. From concerns about cost and demonstrating return on investment (ROI), to practical considerations about who will manage the process at your company, ERP implementation efforts require commitment by a project team and support by business leaders to ensure success. There’s no getting around the fact that ERP deployment is a major undertaking, but the process doesn’t have to be painful. With proper planning and execution, implementing an ERP system should be a smooth process and quickly improve efficiency across your business. Here are three critical ERP implementations best practices to consider when selecting and deploying a solution. During any evaluation of ERP software, the implementation process will come up. For most business managers, installing an entire ERP system is uncharted territory. Help your teams prepare for discussions with vendors so that they can ask the right questions. Don’t let the terms intimidate you. For smaller organisations, these steps can take days — not weeks or months. Most importantly during the implementation, remind your team that no one knows the business better than they do. It is best practice to identify a dedicated project leader and a team for your ERP implementation will help ensure that the project goes smoothly. For ERP team members, consider reassigning or removing some of their normal job duties so they have enough time to concentrate on the task at hand. Identify a team leader with strong project management skills who can facilitate team communication, address any issues that may arise and keep the implementation on schedule. Having confidence in your knowledge of what the outcomes should be, will be best served if you remain flexible on how to achieve those outcomes. 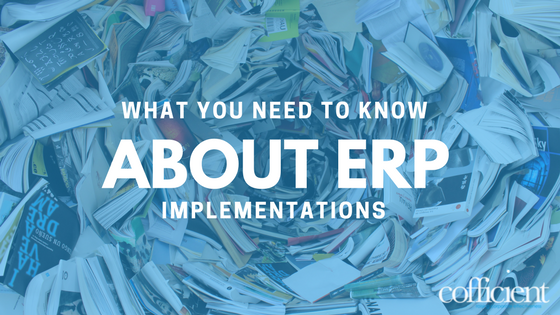 ERP systems often incorporate best practices that may not be the way you always did things. Be open to change that increases productivity – that is the benefit of ERP. Requirements Analysis – define the business processes that support the operation of the business. Solution Design – align the functionality of the ERP software with the business requirements. Development and Configuration – define any customisations or addons in addition to the ERP system that are needed to support the business requirements. Deployment and Training – migrate data from the old system, test new processes and train employees how to use the new system. Operations – refine and improve the system over time. Most ERP systems offer more functionality than you will want to deploy initially but can be added over time. Make the most of the opportunities that the connected world offers. Move to an ERP system to deliver world class service and build new markets. Cofficient is in the business of ERP success. We will ensure you have the right system and implement it properly so the software lasts. Contact us today for more details on any of the above critical success factors, or any other issue or question related to making your ERP project reap all the business benefits it should.